Bellator MMA came THIS close to having three of the planet’s top lightweights under their banner. After having restricted free agent Gilbert Melendez (pictured) accept an offer to join their promotion, the UFC announced Sunday night they have decided to match their rival’s contract. Melendez will break in his new UFC deal by coaching opposite lightweight champion Anthony Pettis on “The Ultimate Fighter 20.” He will then challenge Pettis for this throne once filming wraps later this year. As customary with all UFC contracts, financial terms of Melendez’s deal were not disclosed. TUF 20 will begin filming in May and premiere on FOX Sports 1 on September 10. This season features the launch of the women’s 115-pound weight class, with the tourney winner being crowned the UFC’s inaugural strawweight champion. 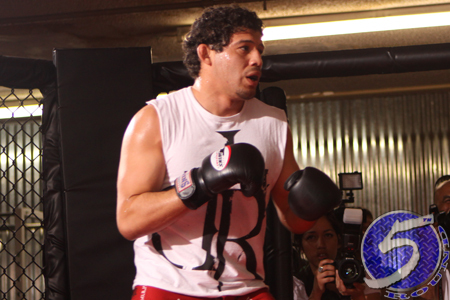 As long as both parties remain healthy, two of Melendez’s first three UFC fights will be of the championship variety. Melendez owns a 22-3 professional record. Prior to joining the UFC in April 2013, he was considered by most as the world’s best lightweight not competing inside the Octagon. Pettis is currently recovering from knee surgery. “Showtime” is expected to receive clearance to return to action by July. Unfortunately for Bellator, today’s news means they missed out on pitting Melendez against reigning champion Eddie Alvarez and Michael Chandler.